Last year’s Tecmo Koei/Nintendo mash-up Hyrule Warriors taught us several key things about the future of gaming. The Warriors franchise isn’t as played out as people think. No mash-up is too outlandish to gain a large following, and more companies need to take risks like this if there is any hope whatsoever for gaming’s future. With the release of Mortal Kombat X, and my lack of a “next-gen” system (pffft, money, right? ), I recently picked up a copy of Mortal Kombat: Shaolin Monks for Playstation 2. I’ve always loved the mythology of the Mortal Kombat (MK) universe, and Shaolin Monks showed us that MK can be so much more than just a one-on-one fighter. While Shaolin Monks provided a solid combat system for a beat-em-up, there was so much more that could be explored in the MK universe. Enter Mortal Kombat: Deception’s “Konquest Mode.” If you’re unfamiliar, this mode follows new character Shujinko in his coming of age journey through all the realms of Mortal Kombat. On his way, he meets, trains with, and fights against a wide roster of veteran MK fighters; learning their moves, and establishing his own fighting style. This mode was truly unique because it was a wide open world that players could explore, freely travelling through portals and visiting incredibly varied landscapes. The open world of Konquest was filled with secrets to find and new areas to explore, including very basic combat in realms such as Outworld, allowing simple punches and kicks as you wander. With this being an extra mode in an already great fighting game, it’s no surprise that it lacked a certain polish that we’d come to expect in a full fledged spin-off game. My question should be pretty obvious by now: Why not make that very game it’s own spin-off? Non open-world series like Mortal Kombat (Halo, Legend of Zelda, etc.) offer such rich universes filled with diverse planets, continents, and races, that the base games barely graze. Legend of Zelda finally got the chance to spread it’s wings and explore this lore with Hyrule Warriors, by completely changing it’s fundamental gameplay. Halo has attempted this with games like Reach, and Halo Wars, but has come closer in it’s widely popular book series. Mortal Kombat could value greatly from this, and the Warriors game series is a great way to enable this. The question is: How? For your consideration, I offer you: Kombat Warriors. Mortal Kombat X’s story mode starts in the midst of a war. Three sides fight for total control, each led by a select group of unbeatable commanders, each with their own varied skill sets and weaponry. Sound familiar? That’s because it’s the entire Dynasty Warriors saga. It’s a formula that works. Kombat Warriors would begin after the events of the first game. The tournament is over, Earthrealm has won. But Shang Tsung and Shinnok are having none of it. Shinnok enacts dark magic that causes all realms to merge together. The results in a new world whose continents are based off of each individual realm. Choosing your warrior (or creating your own), it’s your duty to fight on the front lines, defeat the other Kombatants, and rule this new world. Players could choose their allegiance from three sides: The good warriors of Earthrealm, the evil forces of Shang Tsung and his Deadly Alliance, or the war driven armies of Outworld, led by Shao Khan. Mortal Kombat: Shaolin Monks offers a combat style ideal for this type of game. Your chosen character has a light and heavy attack, a throw, as well as four special attacks accessed by holding a shoulder button. 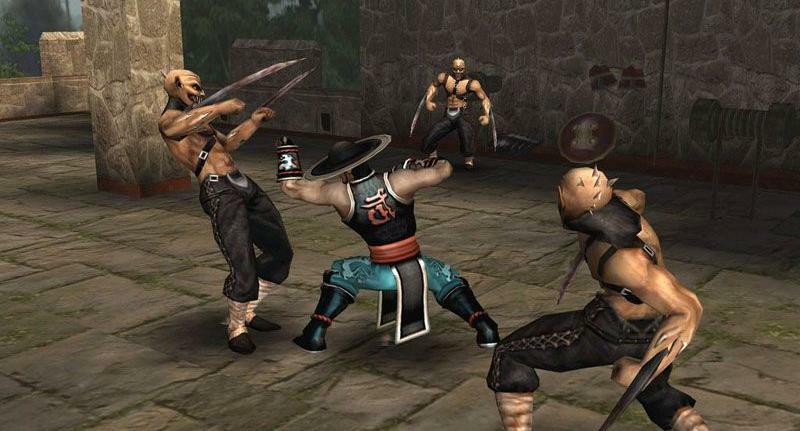 Fatalities could also be performed after filling up a gauge, but this feature would be reserved for fights against the generals, as it slowed the game play of Shaolin Monks significantly. Dissimilar from the Dynasty Warriors series, instead of swinging wildly and hitting large numbers, the player would feel a closer connection to the action, much like with the Batman: Arkham series, having to balance combos from one enemy to another, sometimes throwing enemy grunts at each other. Countering would also be a prominent mechanic, making the traditionally 1-on-1 MK combat feel applicable even in a large scale battle. Battles would take place closely to that of Dynasty Warriors. Armies would combat each other with the player acting as a higher ranking fighter, trying to gain the upper hand and control the battlefield. When the player reaches the enemy’s Commanding Officer, however, the game play switches seamlessly to that of traditional Mortal Kombat. The remaining soldiers in the area would either continue fighting in a dynamic background, or circle around the two Generals, cheering their commanders on. Victory would allow the player to either spare their opponent, giving them a chance to change sides in the war, or execute them (either with a fatality, or any other finishing move offered in the MK series), and the joy/misery of the soldiers in the background would change appropriately depending on who won. Sounds a little too close to the Dynasty Warriors series, right? Well here’s where the power of next-gen comes into play. Between battles, the game takes place in an open world. As players defeat the opposing armies, and claim their land for themselves, new cities become open for exploration, trade, and side-quests. Depending on when or how they reclaim a city, certain stores or areas might be destroyed, changing the storyline itself, the side-quests (kuests?) available, and the NPCs encountered. This would obviously up the replay value tremendously. Stores located in these cities would act as the Krypt in past games, allowing the unlocking of new skins/costumes, and more. A morality/conversation system akin to Mass Effect would allow the player to further learn about the lore and characters, possibly influencing their actions or morality in battle. Throughout the story mode of every base Mortal Kombat game to date, I’ve never felt like I actually the power of saving the world in my hands. The best the player can ever hope for is being the one who punches the big bad guy and stops all of the off-screen death that we’re supposed to care about. Think how invested you’d be in saving the world when you can see what your actions cause! Kombat Warriors would give you the opportunity to decimate an entire army single-handedly as Scorpion. Woo Sonya Blade as Johnny Cage. Smash two grunts’ heads together as Shao Khan. Maybe even transform as Shang Tsung, and convince another General to switch sides in the upcoming battle! The combination of large scale combat, intense 1-on-1 finales, and strategic morality and conversing would make this an absolutely unmissable crossover game.